Brief Synopsis – A vagabond poet who is leading a rebellion against the King is given the opportunity to rule the country for a week to see if he can do a better job. My Take on it – This is a story with a great premise that is able to work on numerous levels. 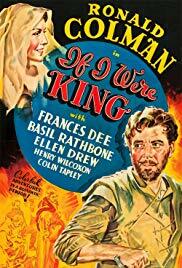 The lead role played by Ronald Colman works extremely well and he is able to show how prolific an actor he can be with this performance. As good as Colman is though, he is upstaged by Basil Rathbone who steal every scene he is in as the King of France. He was very deservingly nominated for an Oscar for his performance here. The story itself is told really well and is a great tale of how sometimes giving your rival an opportunity to show what changes they envision need to be made in government policy while trying to make a difference. What surprised me the most about this film is the fact that in the 80 years since it was made, no one has tried to remake it. As someone who usually isn’t a fan of remakes, this is a story that is still very relevant today and would work quite well even in a modern day setting. Bottom Line – Very intriguing premise that works on numerous levels. Colman is great in the lead and shows how prolific an actor he can be with this kind of role. Rathbone tho steals every scene he is in and deservingly was nominated for an Oscar for his work a the French King. The story is a great tale about giving opportunities to the seemingly disadvantaged and see how they envision what changes in government policy need to be made in order to make a difference. Surprised that this film hasn’t yet been remade after 8 decades because it is still a relevant theme for today’s world. Recommended!